Congrats to Emily L. who is the lucky winner of the Ban.do no.60 bridal headband contest. This is so beautiful!! I am looking for something gorgeous to wear on my hair, to complement my much simpler gown. Emily was the 43rd person to comment. 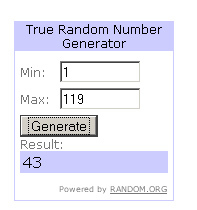 The number chosen by The Random Number Generator was 43. Thanks to everyone who participated in this fabulous giveaway!